Meet Reed Kotalik, an 8-year-old runner who won’t let Cerebral Palsy stop him from giving his all to being the best athlete, brother, and friend he can be. Reed Kotalik was born with laryngomalacia and, after much testing, was diagnosed with Cerebral Palsy. After going through significant rehabilitation to strengthen and condition muscles, Reed has stepped up to 33 national podiums across the country and won 9 national championships in running and field events. 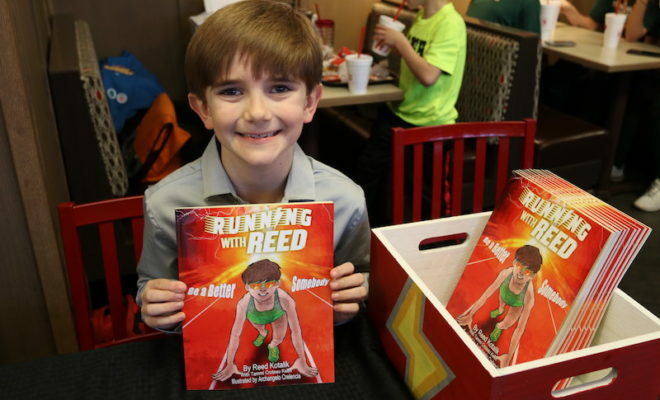 Not only is Reed a competitive runner, but also just published a children’s book on January 2, 2018 titled Running with Reed: Be a Better Somebody. The book is more than a book and more than a young runner who has Cerebral Palsy. It is a story about using each opportunity to become a better somebody. Reed held his first book signing on February 2 in the community that he loves – in The Woodlands at the Chick-fil-A in Alden Bridge. Reed’s family, friends, fellow athletes, fans and the community came out to support Reed in kicking off the book signing before he goes on a national book tour, beginning in Boston, Massachusetts and ending in Virginia for Spring Nationals. Reed’s running has not only has brought awareness to Cerebral Palsy, but also helped raise awareness for CASA for foster kids, Batten Disease, Head for the Cure, and Juvenile Diabetes. 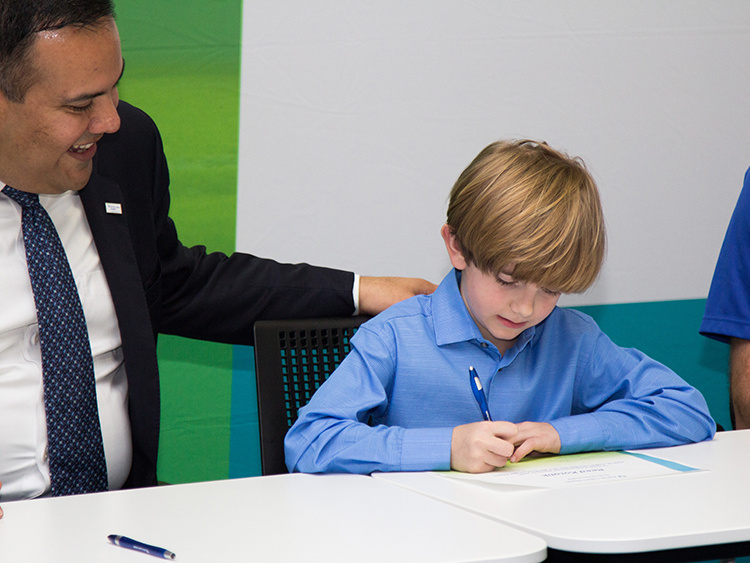 Reed was named as the national ambassador for the Make Lemon Aide for Cerebral Palsy Foundation. 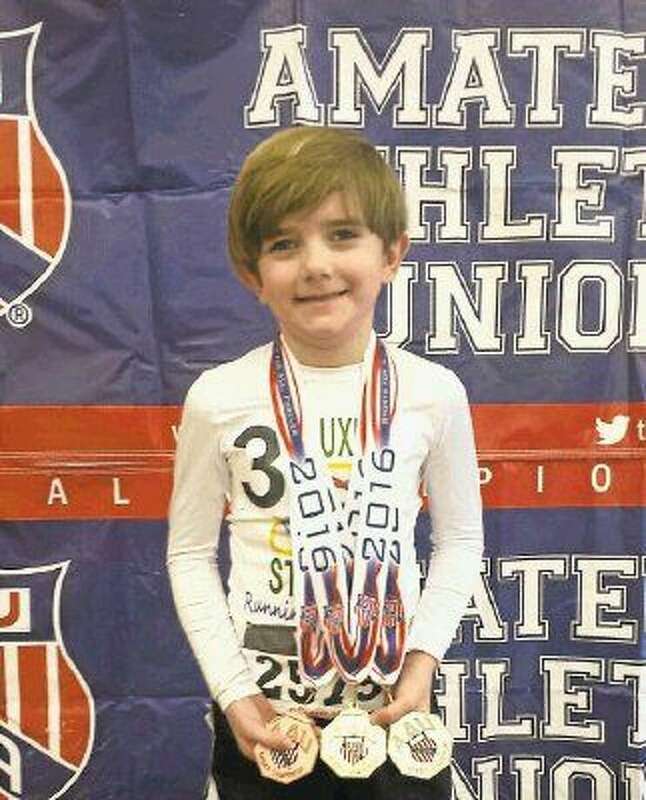 In February of 2017, AAU Track and Field named Reed as its’ national spotlight athlete. In August 2017, he challenged friends to join him to do 21 Random Acts of Kindness in one day to honor friend, Grant Milton. Reed makes public appearances to benefit literacy causes, has hosted drives to gather books for hospitalized children, and provided school supplies and toys for those in foster care. At the February 2nd book signing, Reed signed and shared his new book with the community, but also gave local children the opportunity to make cards and bracelets for senior citizens plus paying to “spin the wheel” and placing Chick-fil-A orders to raise funds for Make Lemon Aide. The kickoff illustrated Reed’s deepest desire to see people coming together for a great cause and it perfectly embodied the message of his book to “be a better somebody” by helping others. Running with Reed: Be a Better Somebody is now available at www.runningwithreed.com along with a companion coloring and activity book as well as a large print edition. Kindergartner Reed Kotalik, 6, of The Woodlands, Texas, doesn’t know what cerebral palsy is. He just knows that his legs don’t work the way he’d like them to sometimes. But that doesn’t stop him from doing what he loves to do—run.Around the time Reed, who has four siblings, was diagnosed with cerebral palsy, he told his mother, Dawn, out of the blue that he would like to try running.So in November of 2014, just after his fifth birthday, she found a one-mile Thanksgiving race for him to run.“I had no idea how he did, I just knew that there were thousands of people out there, and so we left,” Dawn Kotalik told Runner’s World by phone. “A couple of days afterward, they called and said they had this two-foot-tall trophy for him. At that point, he said he wanted to do more races.”VideoFour months after his diagnosis, Reed competed in the AAU 14-Under Youth National Indoor Track & Field Championships and took home gold medals in the 400 and 800 meters. Runners World wrote an inspiring article on Reed in March of 2016. You can read more here. In 2016, Reed isn’t just running for big medals and National titles. Cerebral palsy is a group of chronic conditions affecting body movement and muscle coordination. In other words, the faulty development or damage to motor areas in the brain disrupt the brain’s ability to adequately control movement and posture. THE WOODLANDS, Texas — Reed Kotalik is a typical, energetic six-year-old boy. In November 2014, he was diagnosed with cerebral palsy. Within the same month, Reed asked his mom if he could run in a local race. He placed third. Cerebral palsy is a physical disability that impairs muscle movement and posture as a result of brain damage before birth, during birth or immediately after. Reed’s mother, Dawn Kotalik, said knowing what her son was dealing with, she was emotional watching him run at all. Once Reed crossed the finish line at his first race, he went home with his family. His mom got a call from the race’s management staff saying that Reed won 3rd place and had a trophy waiting for him. What Dawn thought was merely a fun activity soon turned into Reed’s pursuit of an early career in track and field. After hearing so many good things about CHI St. Luke’s Health – The Woodlands Hospital Performance Medicine department, Dawn decided she wanted to see how they could help her son develop into an athlete. When Reed met the department’s lead physical therapist, Andrew Arthur, PT, there was an instant connection. Arthur, who works with a wide variety of athletes, said that Reed is certainly a unique patient. A year of working with Arthur dropped Reed’s mile time by three minutes and helped him gain more control of his legs and feet. Arthur said that cerebral palsy can majorly affect muscle tone, coordination and symmetry. With this in mind, Arthur fine-tuned Reed’s training to transition the muscular therapy to athletic development. The young runner also trains with Chris Bilbrew, a local athlete who will be running the 800-meter at the Olympic Trials in July. Bilbrew formerly coached Reed’s older brother, and Reed’s mom decided it was time to reconnect. Bilbrew said that in an attempt to keep Reed’s training and his own separate, Reed has no idea that Bilbrew runs competitively. To Reed, Bilbrew is just his coach and running buddy. Three paths crossed about two months ago when Bilbrew needed to see a doctor for a knee injury. Having a great experience with CHI St. Luke’s, Dawn suggested that Bilbrew get treated at the same facility. During his first appointment, Arthur found out that Bilbrew was training for the Olympic Trials and offered him a spot in their department’s athlete sponsorship. After meeting with the staff and seeing the different amenities that he’d never before had access to, the decision to train with CHI St. Luke’s was a no-brainer. Arthur said from a physical therapist’s perspective, it was fun to see all the paths converge at CHI St. Luke’s Performance Medicine department. He said it was exciting to have one of his patients coaching another. Since winning 3rd place in his very first race, Reed has accumulated titles and awards from Run Houston and the AAU National Championship. He recently began to endeavor into field events, and at the West Coast Primary Championships in July, Reed won the gold medal in shot put and brought home several other medals. Seeking more than athletic success, Reed wants to start competing to contribute awareness to causes such as cerebral palsy, CASA, batten disease and Head for the Cure. For more information about CHI St. Luke’s Health – The Woodlands Hospital Performance Medicine department, visit their website at www.chistlukeshealth.org/performancemedicine. As Grant Milton rests in his bed at Touchstone Neurorecovery Center in Conroe, he is surrounded by his favorite things and memories of his favorite people. There’s a blanket with a collage of images with friends and family printed on the thin fleece fabric. His vibrant LeBron James socks are rolled together as a pair and safely tucked away in his closet. And a hand-crafted pillow with the No. 21 proudly displayed in red and green numbers sits on the cushion of the easy chair in the corner. 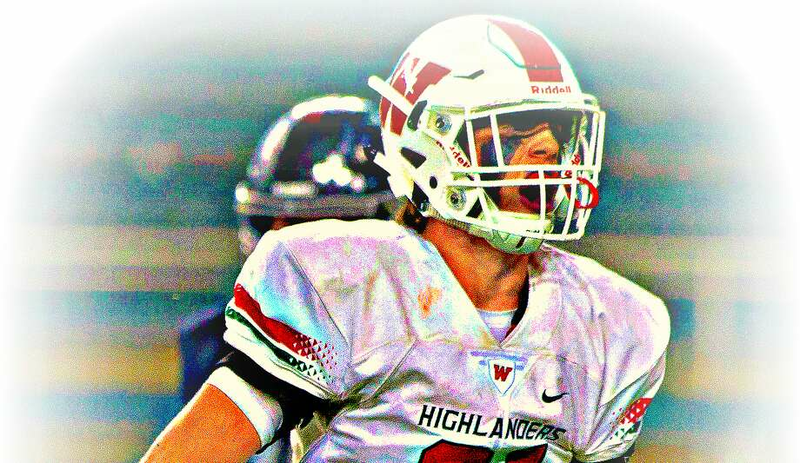 For now at least, this is home for Grant as he continues to recover from a traumatic brain injury he suffered while playing football for The Woodlands High School nearly eight months ago. Grant will turn 19 years old on Aug. 3. And while his future still remains uncertain, the road that has brought him to this point has been one filled with emotion for those who care about him the most. There have been moments of pure joy and others filled with extreme sorrow. But through all of those turbulent times, hope has remained, and love has triumphed above all. As the minute hand crept closer and closer to 5:30 p.m., the sun began to capsize behind the confines of McLane Stadium at Baylor University in Waco. With the turf playing field illuminated by an array of bright stadium lights, the sky shifted to a vivid display of pink and purples hues. The temperature held steady in the 50s on a crisp evening in late November. It was perfect weather for a high school football playoff game, and just a couple of hours after the autumn evening fell into darkness, The Woodlands and Austin Bowie clashed on the gridiron in a memorable shootout in the Region II-6A semifinals. The Highlanders unleashed their ferocious offensive attack on the Bulldogs with senior quarterback Eric Schmid leading the unwavering charge. When the smoke cleared, the undefeated juggernaut from South Montgomery County had emerged victorious, taking control early in the second half before rolling to a 52-31 triumph. But as The Woodlands and its faithful fan base began to experience the sweet emotions of the impending final whistle, Grant Milton was nowhere to be found. With the fourth quarter winding down, the senior outside linebacker was no longer in the game. He was no longer standing on the sideline with his teammates. He was no longer in the stadium. All that remained was his shoulder pads, fully draped in his white No. 21 jersey and a Gatorade towel, hunched over on the ground next to the Highlanders’ metal bench. The holiday season can be a hectic one for people working in retail, particularly on Black Friday and the weekend that follows. That was the case for Patty Milton as she wrestled with the fact that she would not be able to attend her son’s game nearly 170 miles away from her home in The Woodlands. Throughout the first half of the contest, the Highlanders’ defense was playing with tenacity, limiting the high-powered Bulldogs to just 10 points. Grant was playing well, and even came up with a big sack of Bowie senior quarterback Wade Smith, which Patty witnessed through the glow of her computer screen. As the game wore on and the Highlanders began to find some separation on the scoreboard, one of those “crunch moments” arose. Bowie was knocking on the door of the Highlanders’ end zone early in the fourth quarter, as Smith had finally found a rhythm with his receivers in the passing game. As an outside linebacker, Grant had many responsibilities, which included dropping into coverage. As Patty was watching the play develop, she noticed that Grant turned the opposite direction of where he was supposed to go, and the receiver he was meant to shut down reeled in a touchdown catch. While Patty was intently watching the game from home that night, Grant’s father, Miles, was able to make the trek to Waco. Miles and the rest of his family sat near the 30-yard line on the east side of the stadium with the rest of the fans from The Woodlands. Being at a Division I college stadium with a sub-capacity crowd meant there really wasn’t a bad seat in the house. As seconds ticked off the game clock in the final period, Miles suddenly heard someone shouting his name. He looked toward the sideline and saw David Lee, Grant’s teammate and close friend, frantically motioning for him to come down to the field. There are 6.5 miles on I-35 South in Waco that stand between McLane Stadium and Baylor Scott and White Medical Center. Every inch of that pavement and every second it took for the ambulance to reach the emergency room doors was crucial. The CT scan of Grant’s head revealed that he had severe intracranial bleeding, and emergency neurosurgery was required. Back in The Woodlands, Patty hitched a ride with a friend to Waco after receiving several calls from Lipscomb, who informed her that she needed to be there as soon as possible. Two hours passed by as Grant underwent surgery at the hands of Luiz Cesar, M.D., who had been practicing neurology for nearly 40 years. By the time Patty got to the hospital, the operation was complete, but her son was not out of the woods. During the final quarter of the game, Schmid was approached by team athletic trainer Charlotte Laverne and informed that Grant had been transported to the hospital with concussion-like symptoms. Schmid had addressed his team and answered questions from reporters after the contest finally ended when he got another update. Schmid, Laverne and trainer Cody Dean rushed to the hospital and waited with Grant’s family as the surgery was performed. Meanwhile, as the rest of the team rode back to The Woodlands on the bus, news of the operation was relayed to the players. Around 3 a.m., after consulting with Miles on his son’s condition, Schmid and Lipscomb decided to head back to The Woodlands. Schmid arrived home around 5 a.m., but sleep was not an option. After a couple of hours had passed, he drove to the school to meet with offensive coordinator Jim Rapp. The two coaches talked about how they would handle the situation with the kids, knowing they also had a regional championship game against Round Rock to prepare for that week. Despite the bleak prognosis, Grant did survive the first night after his surgery and spent the next two and a half weeks in Waco in a coma. The Highlanders, meanwhile, rallied around their fallen teammate and dedicated the remainder of the season to him. The very next Saturday against Round Rock, the Highlanders went back to McLane Stadium, dressed in the same white uniforms, and beat the Dragons 41-18. Patty was there watching the game from a suite, which had been offered to her by former Baylor coach Grant Teaff. As kickoff approached, the Highlanders’ captains ― Eric Schmid, Michael Purcell, Chris Stewart and Zach Loane ― walked out to midfield together for the coin toss. Purcell and Loane carried Grant’s pads and jersey with them to christen their teammate as an honorary captain. All throughout the stadium, the No. 21 could be seen. There were t-shirts, signs, helmet decals for the players, and even a banner hanging from the railing on the Round Rock side that read, “All of Dragon Nation is #MiltonStrong21” in the Highlanders’ colors. After that game, The Woodlands went on to beat Allen in the state semifinals before ultimately falling to Lake Travis in the state championship game at AT&T Stadium in Arlington. Patty was there at the send-off rally, offering hugs to the players and coaches as they boarded their charter bus. And although the season ended with a disappointing loss and a 15-1 record, the players showed their character as they fought for Grant on every single snap. The day after Grant’s surgery, a prayer gathering was organized at StoneBridge Church in The Woodlands, and Grant’s family watched on a cell phone as the community came together to show its support. That evening was just the beginning of what would turn into a tidal wave of support and outpouring, not only from The Woodlands community, but also from across the state of Texas and beyond. As of Saturday evening, the total amount raised was just more than $147,000 with more than 1,666 individual donations. More than $100,000 of that came within the first few days. Over the next several weeks after the injury, various fundraisers were organized by supporters of the football program with specially-made t-shirts, wristbands and other assorted items being put up for sale. Local business also chipped in, offering a portion of their proceeds during certain times of the day to the Milton family. While Grant was in Waco, a waitress at a local restaurant overheard his brothers talking about their situation and later prepared a homemade meal for them. Smith, the same quarterback who Grant had tackled to the ground during the game against Bowie, traveled almost two hours for a hospital visit with his mother to show his support. The Allen Eagles, who the Highlanders defeated on their way to state, gave the family a football-themed wall decoration that reads, “I can handle anything that life throws at me.” It hangs above Grant’s nightstand to this day. And a man from the Dallas area sent Schmid an old bronze statue of a football player that he had reluctantly held onto for years. The metal figurine dons the No. 21, and when the man heard of Grant’s situation, he knew there was a reason he kept it. Those gestures, along with countless other acts of kindness, made a big difference for Grant’s parents and siblings. “The broad community has been just unbelievable,” Miles said. While Grant has been battling his own condition, Patty has also faced personal health struggles. She was first diagnosed with breast cancer at age 38 when the family lived in Ohio. Grant was very young at the time, and after receiving treatments over an extended period of time, Patty finally reached remission. But after they relocated to Texas, she was re-diagnosed with Stage 4 cancer. She is still battling the disease to this day. Before Grant’s injury, Patty was very involved with a program called Canopy, which originated at Memorial Hermann-The Woodlands Hospital and provides cancer patients and caregivers with an assortment of complimentary support and educational services. She is hoping that one day a similar program will become available in the area for those dealing with neurological disorders and injuries. “It’s an incredible gem in The Woodlands community and all of Montgomery County,” Patty said. Over the first seven months after the injury, Grant lost 30 pounds from his 6-foot-1, 190-pound frame. He is still unable to speak, using “Yes” and “No” cards to communicate by looking at them when asked a question. He is still receiving tube feedings and is not able to consistently move on his own. It’s been a long road, from Baylor Scott and White in Waco, to a brief stint at Nexus Specialty Hospital in The Woodlands, to TIRR Memorial Hermann in downtown Houston, and now to Touchstone. Both Patty and Miles have expressed a great deal of gratitude for all of the medical professionals that have helped their son in his recovery. But despite those instances of progress, no one is quite sure what his long-term prognosis will be. As the swelling in his brain decreased in the weeks following the injury, it gave rise to ischemic bilateral strokes, leaving several areas on both hemispheres permanently damaged. Grant is essentially undergoing a re-wiring of his brain. While the injury has adversely impacted his young life – Grant had his sights set on possibly attending the University of Oklahoma this fall with La Canfora as his roommate – the silver lining is the impact his story has had on others. It was apparent when youth football players Anderson and Ashton Adkins came to visit him at Touchstone. Or when Reed Kotalik, a young athlete with cerebral palsy, runs a race with Grant’s No. 21 on the back of his shirt. The 21 Strong Foundation was created by classmate Grant Farley and Mel Saettone with the goal of being an advocate financially and socially for high school football players who have suffered brain injuries like Grant endured. As La Canfora prepares to leave for college at Oklahoma later this summer without his best friend, he is constantly reminded that each day is a gift.